Hawaiian coffee is one of Hawaii's top agricultural products. With an annual production of over 8 million pounds, Hawaii is the only U.S. state where coffee is grown. Coffee plants were first brought to Hawaii in the early 1800's, but it was not until the early part of the 20th century that coffee production finally took off, primarily on small farms. While the Big Island's Kona Coffee has gained the most notoriety, coffee is currently grown on each of the major islands on over 950 farms and on more than 7,900 harvested acres. The combination of warm, sunny weather, rich volcanic soil, rolling hillsides, tranquil trade winds, and ample rain helps to make different styles of coffee in Hawaii some of the best in the world. As of 2017, coffee was a $62 million industry in Hawaii. As is the case with macadamia nuts, roasted coffee beans, and pre-ground coffee are less expensive to purchase while you're in Hawaii. It's not surprising to find many island visitors stocking up on coffee in order to bring it back home. To help combat high shipping costs tourists may face, many Hawaiian coffee farms have their own websites and will ship products at a considerable saving. Let's take a closer look at some of the different styles of coffee in Hawaii. Grown on over 600 independent farms and exclusively within the borders of North and South Kona on the Big Island of Hawaii, Kona Coffee has a delicate, aromatic flavor. It accounts for almost half of the total coffee grown in Hawaii and is often used as a blend with harsher, foreign coffees. Coffee aficionados, however, consider 100 percent Kona Coffee to be the only way to go, but be aware, as some folks find it to be quite strong. The Kona Coffee Farmers Association maintains an informative website with details on the farms that offer tours and tastings at their facilities. If planning a visit to the Big Island later in the year, be sure to plan your stay around the annual Kona Coffee Cultural Festival, held every November. Ka'u Coffee is grown on the slopes of Mauna Loa above Pahala in the Ka'u (most southern) District of the Big Island of Hawaii. First farmed by former sugar cane workers in 1996, Ka'u Coffee has become a big success with high placement in national and regional tasting competitions. Ka'u coffee is known for having a distinctive aroma with a floral bouquet and very smooth taste. If you're on the Big Island, you can purchase Ka'u Coffee at farmers markets, local stores, and the Hilo Coffee Mill. Puna Coffee is grown on the slopes of Mauna Loa near Hawaiian Acres in Puna, located between Hilo and Hawaii Volcanoes National Park. This coffee is known for being full-bodied and heavy, with nutty overtones. It is reminiscent of some finer mochas when roasted to a medium level. If you're on the Big Island, you can purchase Puna Coffee at farmers markets, local stores, and the Hilo Coffee Mill. Hamakua Coffee is grown on the slopes of Mauna Kea, north of Hilo in the Hamakua District of the Big Island. Thirteen farmers brought coffee farming back to this area in 2000, an industry that hadn't been seen in Hamakua for almost 100 years. On land formerly owned by the Hamakua Sugar Company, comprised of five to seven acre lots, about 100-200 acres is harvested annually by local farmers. If you're searching for coffee with incredibly rich flavor and a chocolaty-smooth finish, pick up Hamakua Coffee at farmers markets, local stores, and the Hilo Coffee Mill when on the Big Island. On Kauai, 22,000 acres of former sugar cane land was converted to coffee in 1987 by the Kauai Coffee Company. Damage from Hurricane Iniki in 1992 destroyed much of the crop, but by 1996 the annual harvest equaled that of the Kona Coffee Belt. The Kauai Coffee Company now grows 100 percent Kauai Coffee using five varieties of Arabica coffee beans on the largest coffee farm in the United States. Kauai Coffee Company welcomes guests to their Visitor Center just off Highway 50 in Kalaheo, Kauai's southwest side. Visitors can sample their estate coffees, browse their gift shop, and take a walking tour or video tour showing the entire coffee process from initial blossoming, harvesting and processing, and final roasting. Kauai coffee is becoming an increasingly popular style of coffee in Hawaii. Some actually prefer Kauai over Kona, stating its mild acidity makes it a much more flavorful cup of coffee. According to the Maui Coffee Association, 32 farms of varying sizes grow numerous varieties of coffee on the island of Maui. Farms are located on the slopes of Haleakala and the West Maui Mountains. There is also an organic farm, ONO Organic Farms, in Hana. 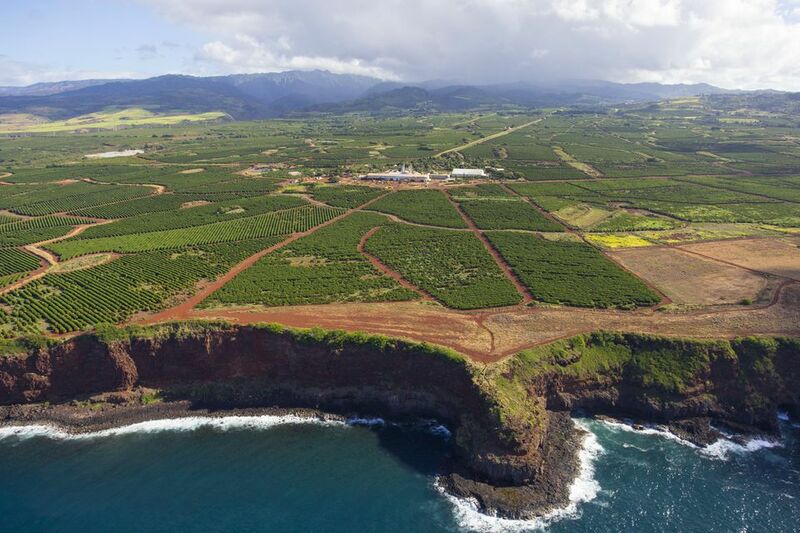 The largest farm, at 375 acres, is MauiGrownTM Coffee, located high above Ka'anapali in the West Maui Mountains. The industry on Maui has grown considerably in recent years, in many cases on land formerly planted with sugar. In central Moloka'i, in the village of Kualapu‘u, a 500-acre coffee plantation and mill is operated by Coffees of Hawaii. Moloka'i coffee is a rich bodied, medium roast coffee with mild acidity. The excellent body is complemented by a luscious hint of chocolate at the finish. It is made from washed and completely sun dried Arabica beans grown in Moloka'i's red volcanic soil. When in Moloka'i, be sure to stop by their Espresso Bar and Café and Plantation Gift Shop. You can also order their coffee online, taking a little piece of Moloka'i home with you. At 600-700 ft above sea level, between the towns of Wahiawa and Waialua, Waialua Estate grows Arabica Typica coffee on 160 acres of former sugarcane land. Interestingly, Waialua Estate also has a 20-acre cacao orchard and is a division of Dole Food Company Hawaii. The coffee is described as having "a smooth mellow, well-balanced cup with a medium body, clean finish, hint of chocolate and a pleasant, lingering aftertaste." Waialua Estate Coffee is available at numerous locations in Hawaii and online.